"The Pistol for the People"
Die hard Glock fans might wish that they could claim the original polymer frame pistol. Unfortunately they cannot. 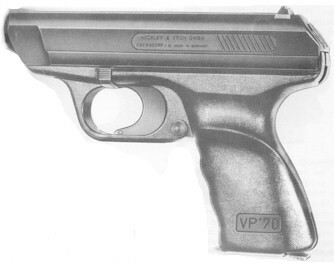 The VP70 is the original polymer frame handgun, with a design genesis of 1968. Way ahead of its time, the VP70 had a lot going for it, and it was designed hand in hand with a buttstock that converted the pistol into a three round burst submachine gun when the stock was attached. The VP70 got its name with abbreviations. VP stands for the German "Volkspistole." "70" is the year of introduction. Volkspistole translated means 'people's pistol.' No longer in production, the VP was known as the VP70, the VP70M and the VP70Z. 'Z' stands for 'Zivilversion,' or civilian version. This was not available with the buttstock attachment. The 'M' in VP70M stands for Militär, or Military in German. When in burst mode, the cyclic rate of the VP70 is a blistering 2200 rpm. 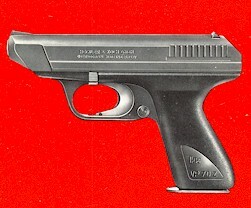 The VP70 was produced in small quantity in caliber 9mm x 21, 400 units. Some examples in this caliber have been offered for sale in the United States. The VP70 itself was designed by the great HK engineer Helmut Weldle and company co-founder Alex Seidel. Production of the VP70 series was halted in August, 1989. 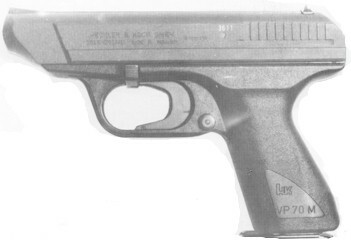 First version of the VP70, capable of accepting the burst stock. Did not have the 'M' designation yet. Fifth version of the VP70, now identified as the VP70M for Militär. One of the most interesting features of the VP70 series is the totally innovative front sight. I have not seen a sight like this on any other pistol. The sight is actually a shadow, produced by double ramps of highly polished steel, that create the optical illusion of a dark post front sight. 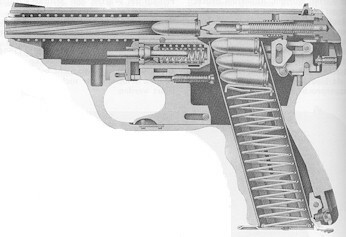 Fourth version of the VP70 with attached shoulder stock. Notice fire selector behind backstrap of pistol, currently selected to three shot burst. Shoulder stock doubled as a rather clumsy holster, reminiscent of the Russian Stechkin series. Close up detail of the front of the burst mechanism. On left, selected to semi-automatic, on right to burst. Patent diagram for rear of VP70 receiver detailing relationship to burst mechanism. Closeup of VP70 receiver and burst mechanism removed from stock to show relationship of parts. 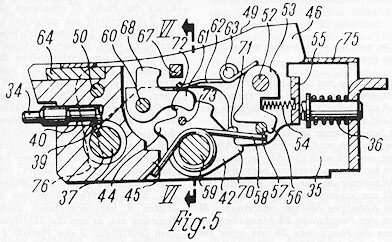 Patent diagram for burst mechanism of the VP70.